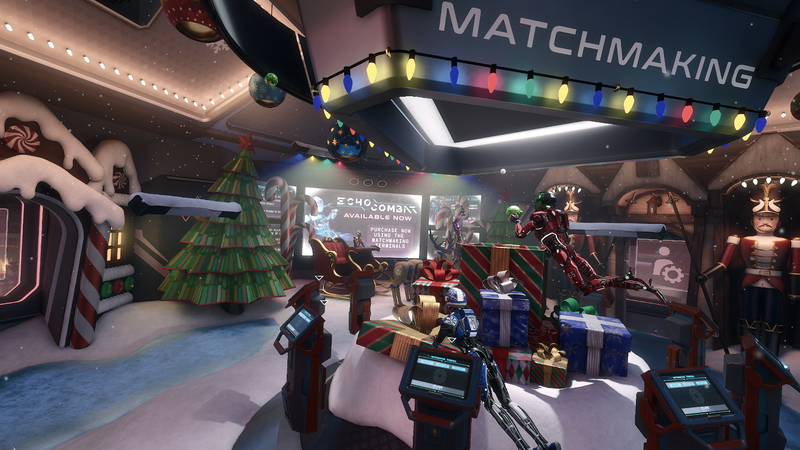 Patch 18.0 brings the annual Winter Village to Echo VR. **Edited on 12/14 to remove the “Find Friends Feature” which doesn’t work at this time. We’ll keep you updated on any progress! 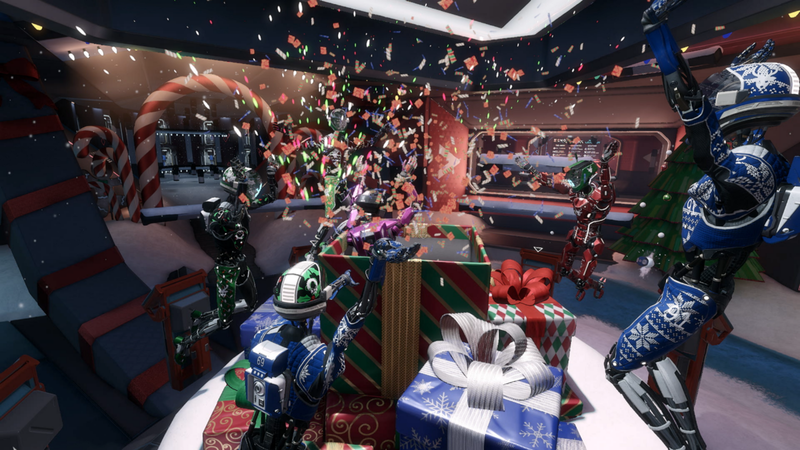 Celebrate the holidays in Echo VR! This year’s Winter Village event will be taking place from December 13 at 10:30 AM PST / 18:30 UTC through Wednesday January 3rd 2019 at 10:30 AM PST / 18:30 UTC! Socialize by the hearth or discover the wonders hidden throughout the Lobby. Compete to unlock a new knit flower pattern, gingerbread man emote, and reindeer decal in addition to unlocking all customizations from last year’s Winter Village event. 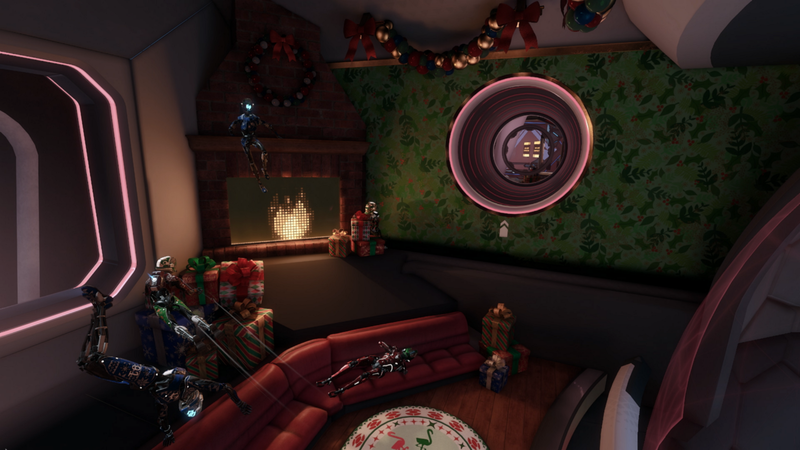 Winter customizations can be unlocked by completing either one match of Echo Arena or Echo Combat during the Winter Village Event (between 10:30 AM PST / 18:30 UTC on December 13th to 10:30 AM PST / 18:30 UTC January 3rd, 2019). Open your gifts before they disappear on January 3rd! Tag us on Instagram, Facebook, or Twitter and share your winter spirit. A mandatory EULA (End User License Agreement) has been added to Echo VR. Veteran and new Echo VR players will be required to read/accept the agreement to gain access to the game. On Fission, players who are on the Defense Team and win will now hear derezzing sound effects for the Payload. · Tapping/slapping the disc within the 2 point area will now correctly award 2 points. · Players are now removed from matchmaking after accepting a party invite through Dash. · The Arm Computer will no longer stop functioning if a Player accepts a Party invite via Dash while matchmaking. · Players should now be able to see all customizations they’ve unlocked at the Customization Terminals. · The Friends List within the Player’s Arm Computer will now update while open. · Booster SFX will no longer persist when swapping bodies. · Brief, static noise will no longer occur when switching bodies for the first time in a new server. · The Central Hub practice disc will no longer de-sync for other players. · Training Dummies will no longer stop moving in servers that have been running for a long period of time. · Players will no longer be invisible when exiting Spectator Mode as a Private Match starts. · In 2D Spectator Mode, the camera pitch in Free Cam will no longer be altered based on the orientation of the Oculus Headset. · Medals will now appear at the end of a Private Match that has been restarted. · Players starting a Private Match with spectators will no longer get stuck on “Creating Match” indefinitely. · The “Team Switch” and “Spectator” buttons will no longer be functional when the “Rules” menu is open on the Private Match podium. · Lobby props that can stick to things (darts, dinos, etc) will no longer get stuck in places and become impossible to grab onto. · The Disc will no longer rarely move before the start of a match. · Stun Field will no longer trigger and stun the Player using it when near their torso. · The “Back” button on the sub-menu for private Echo Combat matches will no longer send players to the Echo Arena sub-menu. · Echo Combat bodies will now display the message “Matchmaking” when searching for a match. · TAC-MODs will no longer be invisible when joining an Echo Combat match in an Echo Arena Lobby. · Players who activate the Repair Matrix will now display effects on themselves to indicate when it’s active. · War Room podiums will no longer rarely appear blank. · The Weapon HUD icon will now accurately display it’s current state. · Miscellaneous issues with text have been fixed and will now display accurately. · Emotes will no longer overlap on a Player’s Echo Combat HUD. · Graphic adjustments have been made to higher detailed patterns so they are now easier on the eyes. · End of Round VO has been changed in Capture Point to now more clearly message the state of the game. · A fully charged Comet head shot on a player close to a wall will no longer occasionally result in a one-hit kill. · Medals will no longer be inaccurate when playing multiple Private Matches in a row. · Payload Overtime effects will no longer trigger unnecessarily if grabbed immediately after the match ends. · The Scoreboard will no longer inaccurately display Players’ names when others leave the match. · Arc Mine HUD icon will no longer remain when quitting out of a match on Dyson. · Bullet effects will no longer appear inconsistent for Players on opposite teams when fired at Spawn Barriers. · Novas will no longer occasionally damage opponents through Spawn Barriers. · Miscellaneous art and collision issues have been fixed on the Dyson and Fission maps. · Players can now late join Capture Point matches during the 20 second period between rounds. · Catapults will no longer rarely get stuck in the forward position. · Players will no longer see dummies’ health bars if they are damaged when they leave the war room. · The Payload will no longer become stuck or trapped behind a locked door. · Grenades will no longer be thrown backwards at high speeds when tracking is lost mid-throw.